How Do You Fix Scratches on Stair Nosings? A common question we hear from customers is what to do if a star nosing gets scratched. Can it be repaired? Will it need to be replaced? In our over thirty years of experience, we’ve found that the answer depends on one major factor – the material of the stair nosing. Unfortunately, most materials that are used for stair nosing profiles can’t be repaired once they’re scratched. Of course, you can choose to replace the stair nosing, but that’s really not practical. After all, a small scratch doesn’t decrease the function of the stair nosing since you probably decided on the profile that you used to protect the step, and it’s still serving its purpose even when scratched. 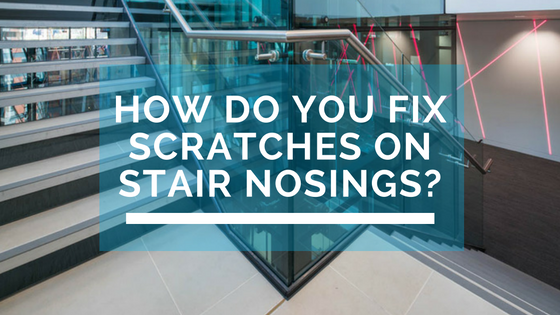 If your scratched stair nosing is metal, you may be able to fix it. If you’ve got an edging with a brushed finish, such as aluminum, you can use steel wool to remove small surface scratches and imperfections. If the stair nosing is a metal profile with a smooth finish, you can try to buff out a surface scratch. Just be sure that your nosing is a solid metal and not a coated product before you start trying to remove a scratch - if it’s coated and you use steel wool or a buffing compound, you could ruin the stair nosing finish. It’s also a good idea to check the manufacturer’s instructions to make sure the solution you choose is appropriate for your specific edging.